Elliott Winton, MD, veteran hematologist with Winship Cancer Institute of Emory University, received a 2016 MPN Hero award in recognition of his commitment to researching and caring for patients with myeloproliferative neoplasms (MPNs), a group of rare blood cancers. Winton received the award at the 2016 MPN Heroes celebration held Dec. 2, on the eve of the American Society of Hematology's (ASH) Annual Meeting in San Diego, California. Winton, a long-time Winship researcher and physician and professor of hematology and medical oncology in the Emory School of Medicine, specializes in the treatment of acute myeloid leukemia, myelodysplastic disorders, and myeloproliferative neoplasms, or MPNs, a group of rare, chronic blood cancers in which a person's bone marrow does not function properly. Winton is also credited with performing the first bone marrow transplant at Emory in 1979 and co-founding its bone marrow and stem cell transplant program. Winton is deeply respected by his Winship colleagues, many of whom attended the awards ceremony. Amelia A. Langston, MD, medical director of the Winship Bone Marrow and Stem Cell Transplant Program, nominated Winton for this honor and says he has been a role model for the entire Winship hematology team. "Dr. Winton embodies what we all strive for as physicians, which is a blend of deep knowledge, honesty, compassion, and advocacy for patients and their families," said Langston. "He has been a teacher and mentor for most of us who care for patients with blood cancers at Winship, as well as for many of our former trainees." H. Jean Khoury, MD, director of the Division of Hematology and a Winship physician and researcher in hematological malignancies, says Winton has brought cutting edge clinical trials to Winship so that patients with these blood cancers do not need to leave Georgia to access state of the art therapies. "Dr. Winton has been a lifeline for patients with MPNs and made invaluable contributions to the MPN community," said Khoury. Winton was awarded an MPN Hero for his "commitment to the individual" and was cited for advancing the science of MPNs through research as well as his commitment as a physician to MPN patients. Winton was one of eight individuals honored as MPN Heroes this year, chosen from scores of clinicians, patient advocates, communicators, and researchers who were nominated. 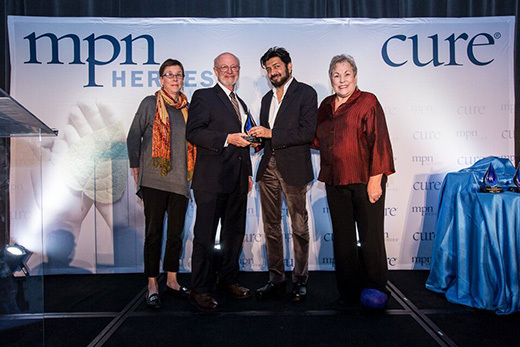 View more information on the MPN Heroes award and recipients.